"Uyuni Salt Flat (Salar de Uyuni)", over 12000km2 pure salt land! Largest Salt Flats in the world! Also the most "flat land" in the world. Private tour, not mixed with others, departures on request all year round. Confirmed from minimum 02 persons, ideal for the couple, family and friend groups. High altitude tour, reaches 3,800m – 4,000m high, possible risk of altitude sickness. The tourists from Asian countries may need tourist visa to enter Bolivia. You can obtain it at the airport upon your arrival. – just need some documents, photos, with small fee. We support you for this issue. Dry Season: April to December. Rainy season: January to March. As roads in Uyuni aren't paved, we will use 4x4 cars, each one with a maximum of 4 passengers. Museums in La Paz closed on holidays, Saturday and Sunday afternoon and all day Monday. Please note it before you set the tour date. Your flight may arrive at La Paz airport in the morning. La Paz, El Alto International Airport is currently the highest International airport in the world at 4,080m/13.115 ft above sea level. Be aware of the altitude sickness upon arrival. Your guide will await at the airport, and Transfer from airport to hotel via a short highway down to the city centre, you’ll enjoy a nice view of the city on the way. A short citytour an Moon Valley tour before check in the hotel, The tour goes through the street markets rich in handicrafts, weavings and witchcraft items, Then descending to the more modern, southern part of La Paz to reach and visit the Valley of the Moon, where a clay mountain has been impressively shaped by erosion. Pick-up from hotel and transfer to the La Paz airport. Local flight 1hr approx to Uyuni airport. Tour starts with 4x4 vehicles; visit the Train Cemetery just outside of Uyuni village where the remains of 19th and 20th century steam locomotives are. Leaving Colchani village and transfer to salt hotel. Dinner at hotel. 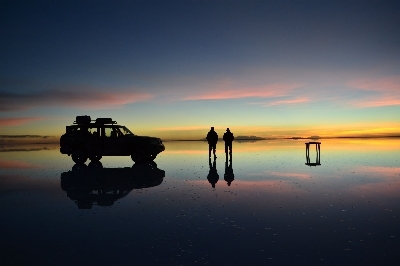 At night, transfer to the banks of Uyuni salt flats. Being in the midst of this landscape full of peace, surrounded by salt, water and the stars in the sky is an indescribable feeling (Depending on the weather). Sun rise excursion: Transfer to the shores of Uyuni salt flats for watching the astonishing sun rise full of incredible colours. Back to the hotel. Salt Flats Uyuni (Full day): After breakfast enter to great salt flats to enjoy of this wonderful place. Picnic lunch at the middle of Salt Flats. Finally, at appropriate time go back to the salt hotel. After breakfasst, transfer to Uyuni airport, Local flight Uyuni to La Paz. La Paz airport reception by English speaking guide and transfer to Tiwanaku ruins. 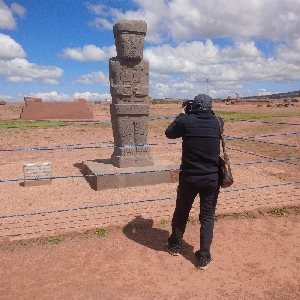 Tiwanaku is a 1.5 hour drive from La Paz (72 km/45 miles), throughout which the highlands are passed and the Aymaran way of life can be seen. 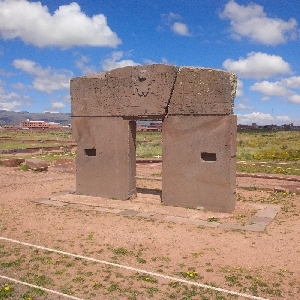 Tiwanaku dating back to 1580BC - 1200AC, was one of the most important pre-Inca civilizations and considered to be among the most developed at the time. The main constructions visited during this tour are: Kalasasaya temple and the Gate of the Sun constructed out of stone, Ponce and Fraile monoliths; Akapana pyramid and semi-underground temple. Two local museums to view pottery, stone work and learn about the culture are also included on this trip. Lunch at local restaurant in Tiwanaku village. 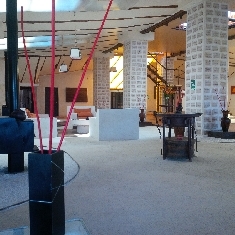 Back to La Paz city, check in hotel. It is recommended to experience the diversity of folkloric singing and dancing in a performance showcasing culture from the Andes, valley and tropical regions of Bolivia. The performers present traditional dances in hand woven clothing and play handmade instruments such as zampoñas (bamboo flutes) and charangos (small guitars made of wood or armadillo skin). Most of the Bolivian cultures are in an unforgettable night of fun. AM: Pick-up from hotel and transfer to the airport. Assist check in your flight home. La Paz – Uyuni – La Paz: US$ 420. The entrances fee and contributions. Accommodation as mentioned in the program. Anything not listed in the program.